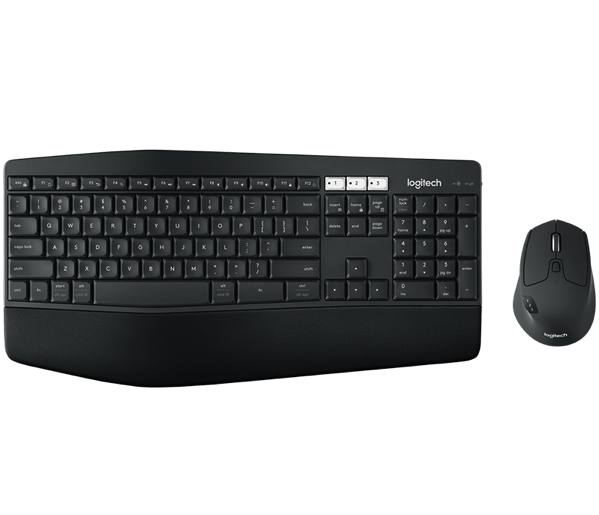 Logitech has today announced the MK850 performance wireless keyboard and mouse combo, a new set of hardware targeted at those who spend a lot of their time working at a desk using a keyboard and mouse. The Logitech MK850 keyboard promises to provide a comfortable and familiar typing experience with carefully crafted keys, featuring a cushioned palm rest providing full wrist support. The curved keyframe, combined with adjustable tilt legs, creates a more natural typing position. The mouse features a contoured design that fits comfortably in the user’s hand, Logitech says. The keyboard and mouse also provide new functionality through Logitech DuoLink, which is available through Logitech Options software and enables the mouse buttons to have a different set of actions and gestures when the user holds down the Fn key on the keyboard. For example, it could streamline interaction with your music player, changing songs by tilting the scroll wheel left and right. The keyboard and the mouse feature Easy-Switch technology, meaning that with the touch of a button you can switch between any three connected devices. The adaptive multi-OS interface recognizes the appropriate hotkeys and shortcuts no matter whether you are using macOS, Windows, Chrome OS computer, or an iOS or Android device. The Logitech MK850 Performance Wireless Keyboard and Mouse Combo is available today in the Canadian Logitech store for $129.99.